Turn the Mill Around Campaign (TTMAC) is proud to announce that work to improve access to the historic Chapman – Beverley Mill in Broad Run has begun. Following several years of planning and fundraising, the first phase of TTMAC’s accessibility master plan commenced on September 1 with the arrival of construction equipment that will lay down a new bus turnaround and parking area at the Mill site. TTMAC received the Chapman – Beverley Mill – an historic 1742 grist mill on the border between Fauquier and Prince William Counties – and its associated property shortly after a 1998 arson that nearly destroyed the structure. 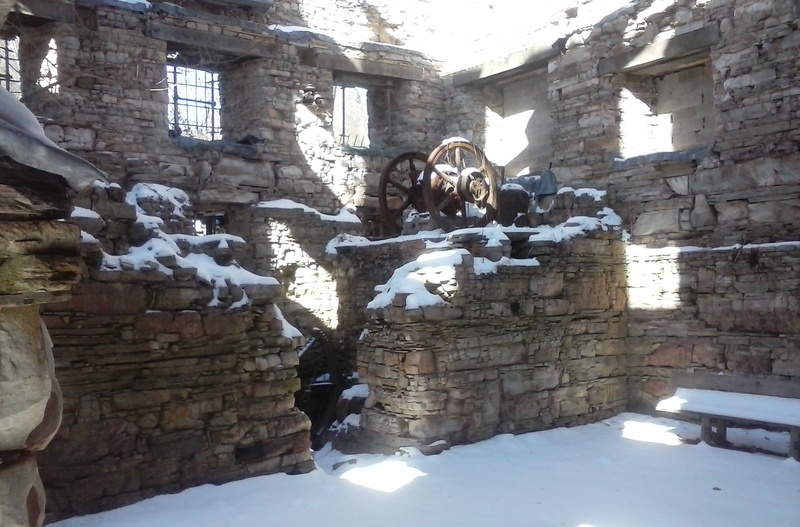 Since that time, the mission of the campaign has been to both preserve the Mill ruins and make the site accessible to the public. Work to stabilize the Mill was successfully completed in the mid-2000’s enabling TTMAC to safely open the site to the public during weekends. The campaign anticipates that the project currently under way will significantly improve visitor experience at the Mill. “We’re especially excited about the bus turnaround,” noted Executive Director Frances Allshouse. “When the work is complete, we will be able to accommodate school field trips and bus tour groups that simply would not have been able to get to the Mill otherwise.” The completed project will also boast 15 new parking places and a handicapped / van accessible parking area. “In the coming months, we look forward to being able to share the Mill with even more visitors thanks to the new parking and bus area,” Allshouse continued. While construction is under way, the site will remain closed to the public. Work is expected to conclude in October. For more information visit chapmansmill.org or contact Frances Allshouse at 540-253-5888 or by email at chapmanmill@gmail.com. A pair of stone pillars now greet visitors as they approach the property at the end of Beverley’s Mill Drive where the stark and imposing remains of the mill loom over I-66 in Thoroughfare Gap. The pillars flank the entrance to the property, announcing to visitors their arrival at a special place. Built by Rappahannock County stonemason Forrest Whorton, his son Jonathan, brother Marty and nephew Vane, the pillars stand three feet square by five feet tall and were erected during Thanksgiving. The stone came from Bull Run Mountain. It is the same quarried stone that comprises the mill itself. The Whortons hand-selected corner stones, a mixture of different stone colors and the “realm,” the large, flat rock that tops each pillar. After the realm was set, the stonemasons returned to the quarry to find something just right to finish the work, and came up with a pair of triangular stones. They mimic the flat, angular schists that jut skyward out of Broad Run, which once powered the mill. Set atop the pillars, the effect is a flame licking upward. “It was all done in the spirit of the mill,” explained Turn the Mill Around Campaign founding board member Andrea Currier. “It’s a contemporary way of expressing the story of the mill.” Some the pillar stones were selected for their dark color, reminiscent of charred wood, a reference to the 1998 fire that left the mill the noble ruin it is today. The stone pillars are the first tangible manifestation of the mill site master plan, which calls for parking for cars and buses, ADA access to the mill, a series of meandering paths and places to pause and learn about the many historic and archeological components of the property as well as the mill itself. In the coming months, look for more updates as the project evolves. Thanks go to Michael Lauterbach of J. Michael Lauterbach Construction in Orlean for overseeing the construction of the pillars and for contributing to their story here. Also helping on the project were Corey Savage, Rappahannock County, and Justin Funkhouser, Winchester. During TTMAC’s recent Adopt a Stone weekend, we were fortunate to meet numerous members of the Broad Run community as wells as many from farther afield. We were thrilled to talk with everyone and share our plans for the future of the site, but most of all it was a great opportunity for us to hear what the Mill means to our supporters. Almost everyone who attended the event had a story to tell about their connection to the Mill – and the variety of those stories was remarkable. Some had ancestors who traveled to the Mill to grind their corn or to barter for flour. Some remembered visiting the Mill Store to buy candy when they were young. Some gathered in 1998 to watch and weep as the enormous structure was engulfed in flames. One young, newly-married couple shared that they had had their first date at the Mill. We’re working to record as many of these memories as possible. Together they show how the Mill continues to be an important part of the community decades after its operations ceased. I found my own connection shortly after I took the position of site director. 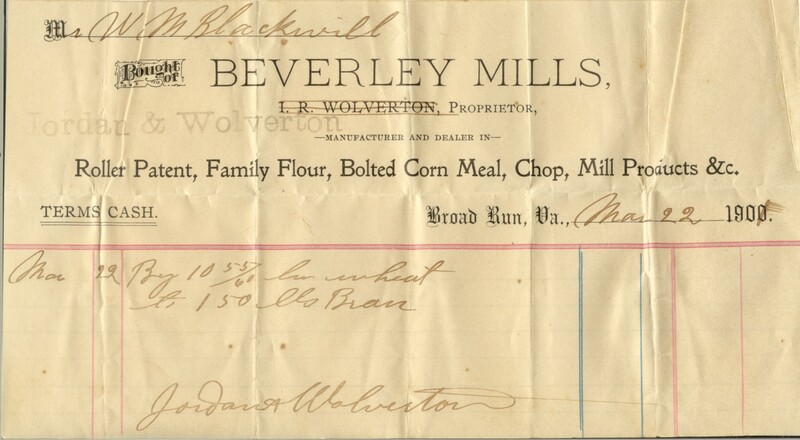 While going through family papers, I stumbled across a receipt written to William Moncure Blackwell from ‘Beverely Mills.’ Apparently, my great grandfather brought wheat from the family farm in southern Fauquier County to the Mill to be turned into bran. Now, a little over 114 years later, I’m helping to preserve the site that was a part of my ancestor’s life. History can be wonderfully cyclical at times! So what’s your story? Has the Mill been a marker for you on your travels to and from DC? Was it a place to hang out as a teen? Leave a comment and let us know what the Mill means to you! -Frances Allshouse, Executive Director, Chapman – Beverley Mill Historic Site. Over the last few weeks we have received several questions about the impact that our upcoming site work will have on the archaeology at the Mill. Moving bulldozers into an area with potentially significant prehistoric and historic artifacts yet to be unearthed is a frightening proposition, but TTMAC has been careful to make plans that will have the least possible impact on the Mill’s archaeological resources. Here are two great examples of how the Campaign is working to preserve the site. Bulldozing will only take place on the current road bed. TTMAC will remove most of the current asphalt road before constructing its new parking and bus turnaround area. 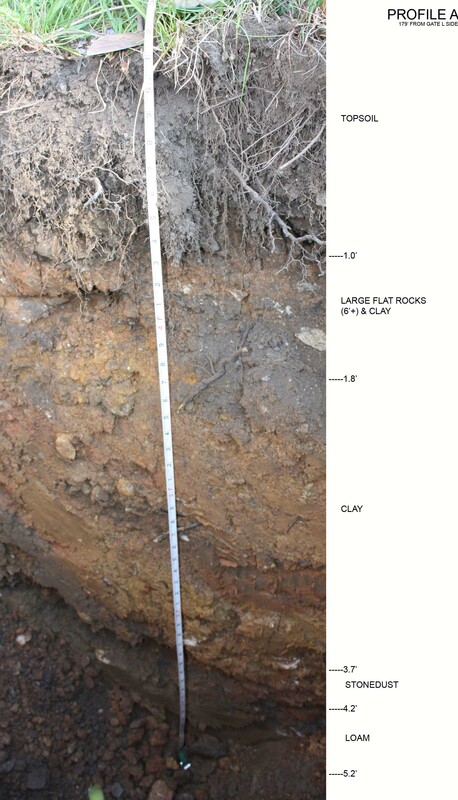 Tests have been conducted along the sides of the road and have shown that the soil there has been previously disrupted, leaving no archaeological material. All-purpose trails will be installed by adding material to the ground level rather than digging down. The result will be that artifacts that may exist just below the surface will be essentially encapsulated and available for later study. We’re excited to see our Master Plan take shape this summer, but we’re equally excited to know that we’re preserving this invaluable historic resource for future generations! The long, cold, wet winter has done its job on more than one project in the area, and we’re no exception. Between contractors being backed up and the bureaucracy wending its way, our park project start is delayed until late summer. Not to worry! Plans haven’t changed. We’re still going to bring you a beautiful park, it’s just going to take a little longer. If all goes well, we should be done with construction by winter, giving the land a chance to breathe and recoup before bursting forth next spring. Meantime, the delay means the Mill will continue to be open to the public weekends at least until the end of June (if this changes, we’ll let you know right away). It also means we can plan events at the Mill this summer. Last but not least, it means we can fine ­tune our fund-raising launch before the bulldozers arrive and the banner goes up (we haven’t told you about this yet) in a few weeks. So look for further news as it develops, right here on Milling Minutes. If you want to be the first on your block to get the news, sign up to get our emails. Since TTMAC received the Chapman – Beverley Mill property shortly after the 1998 arson that nearly destroyed the structure, the campaign has striven to both preserve the Mill and make it accessible to the public. Our first order of business was to stabilize the Mill structure (Look out for a blog post on stabilization techniques soon!). With stabilization completed in the mid-2000’s, we looked to discover more about the site through archaeology. Now, with our archaeological study underway, we seek to share all that we’ve learnt with the public! 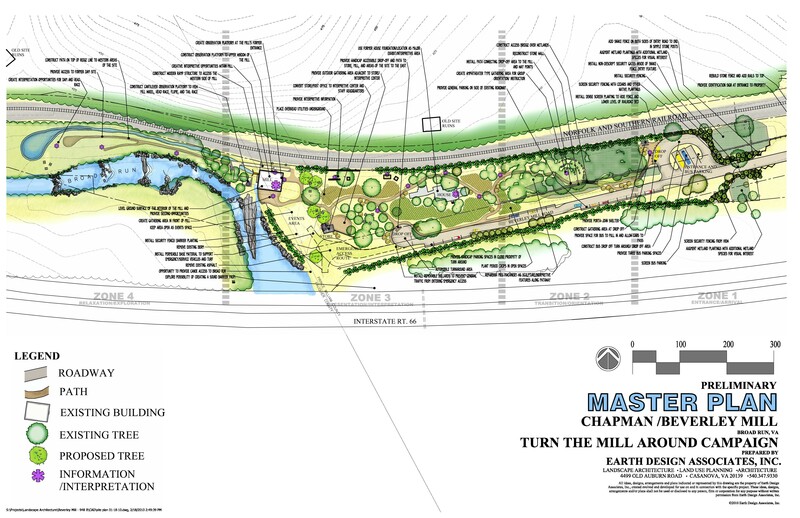 Beginning in the spring or summer of 2015, TTMAC will start improving the Mill site — adding walking paths, informational signage and hopefully increasing hours of access. The image that accompanies this post is an early rendering of TTMAC’s master plan for the site. The plan has changed slightly since this drawing was created, but we hope you’ll take a minute to examine it. It gives a great sneak peak at some of the developments you can expect to see when you visit the Mill in the coming months. And once you’ve taken a look, let us know what you think! Leave a comment below or shoot us an email at chapmanmill@gmail.com.